Thanks. 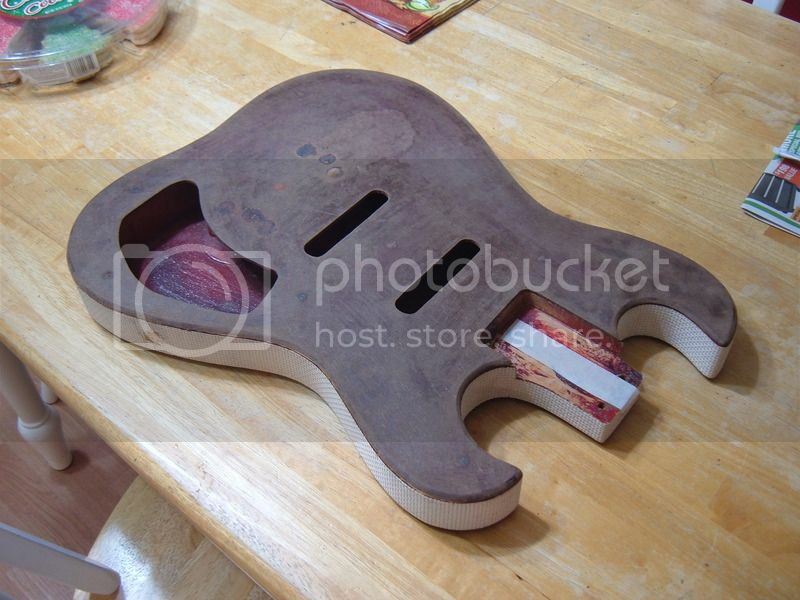 Yeah the shape is definitely not upper fret friendly. More of a three chords and a fuzz pedal guitar. 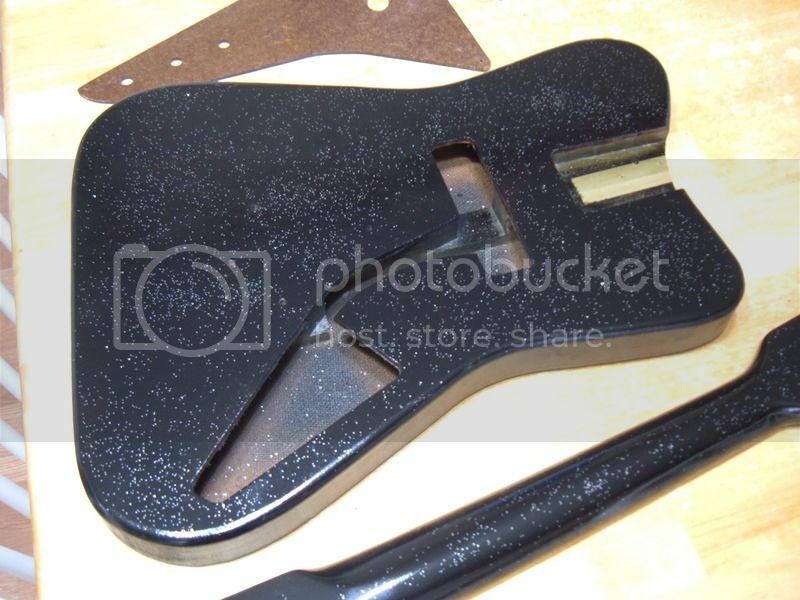 I was thinking of black with silver flakes like the old Sears Silvertone 1448's. 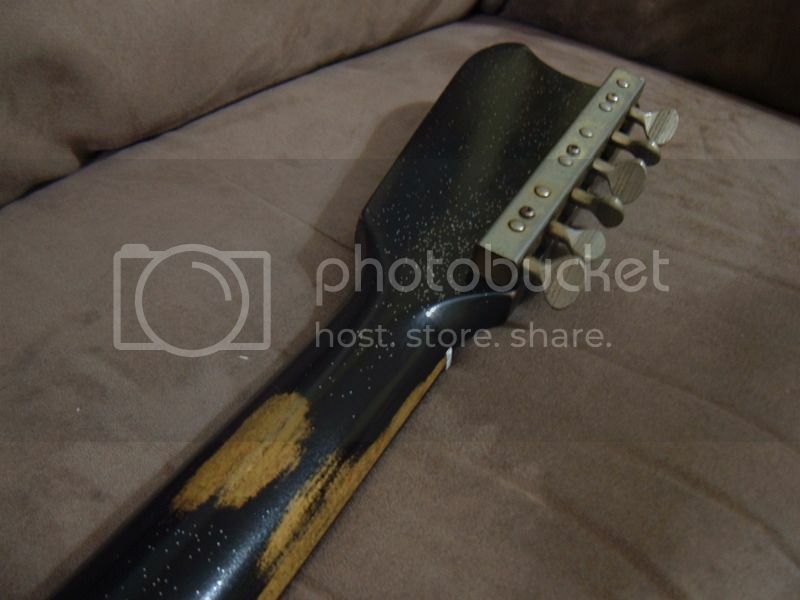 I'm restoring a 1964 Silvertone 1448 and the back and the neck had been spray painted. One flat black and the other blue and red. Go figure. 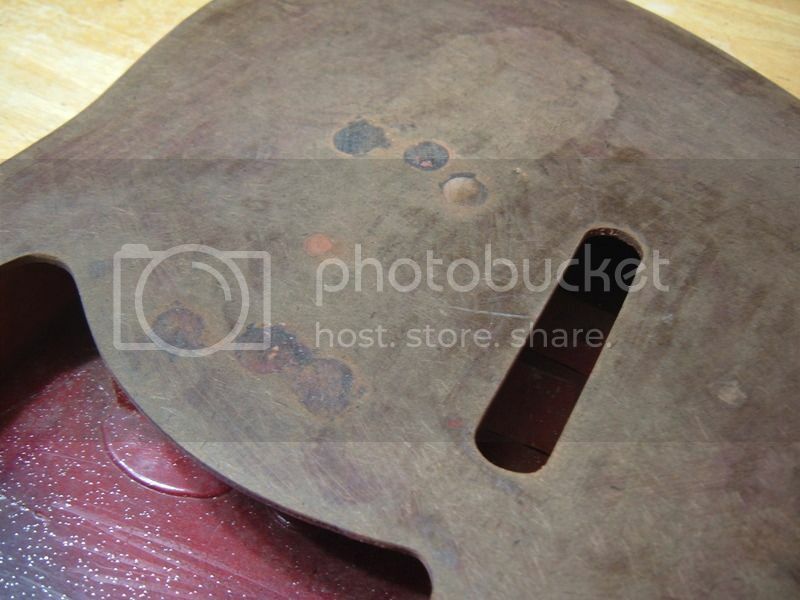 Anyway, I've stripped that off and repainted it to match the original front. It turned out pretty nice as far as a matching up. 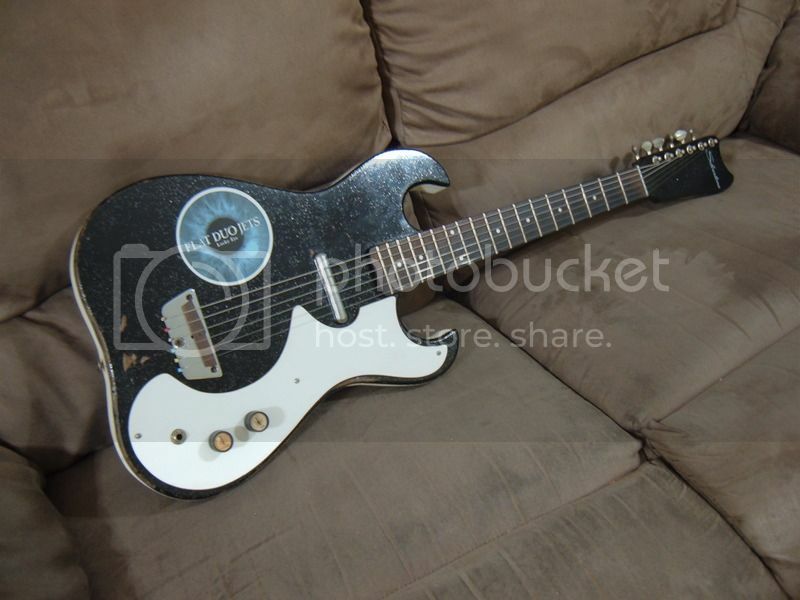 Finished the 1964 Silvertone 1448 restore project. 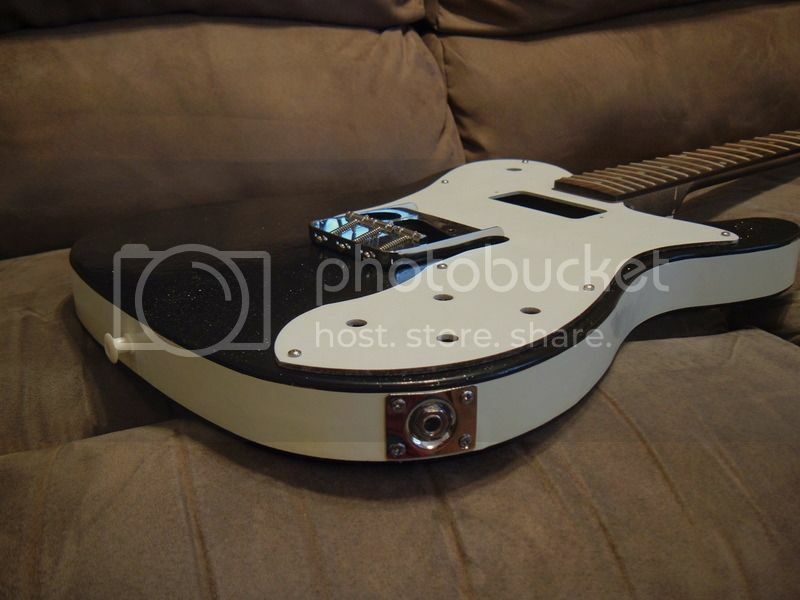 This thing sounds amazing to have just the one pickup. 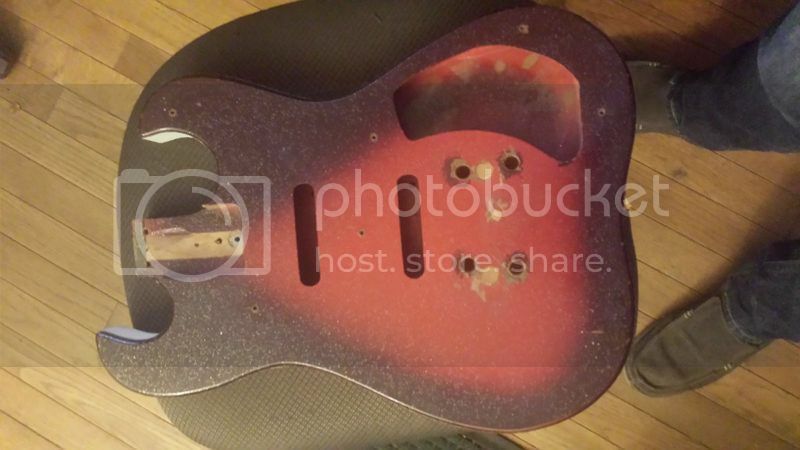 The guitar body was pretty worn. I wanted to keep the original front paint. 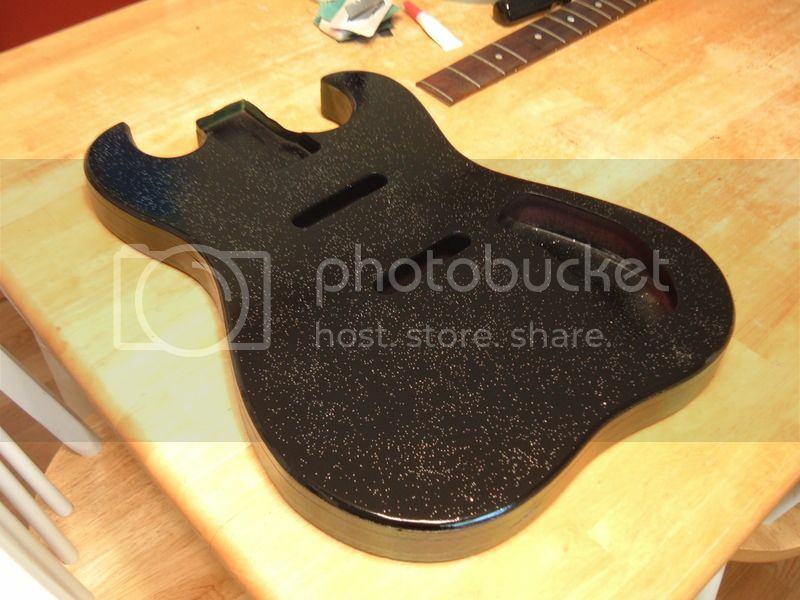 The back had been spray painted and so had the neck. 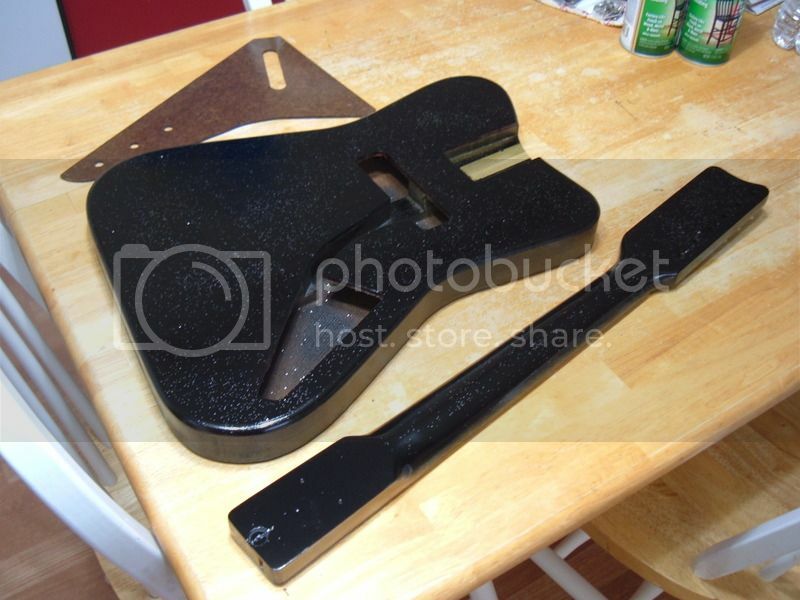 I stripped that and refinished them to match the front. I gave them both some heavy wear to match the front. Looks ace bro! 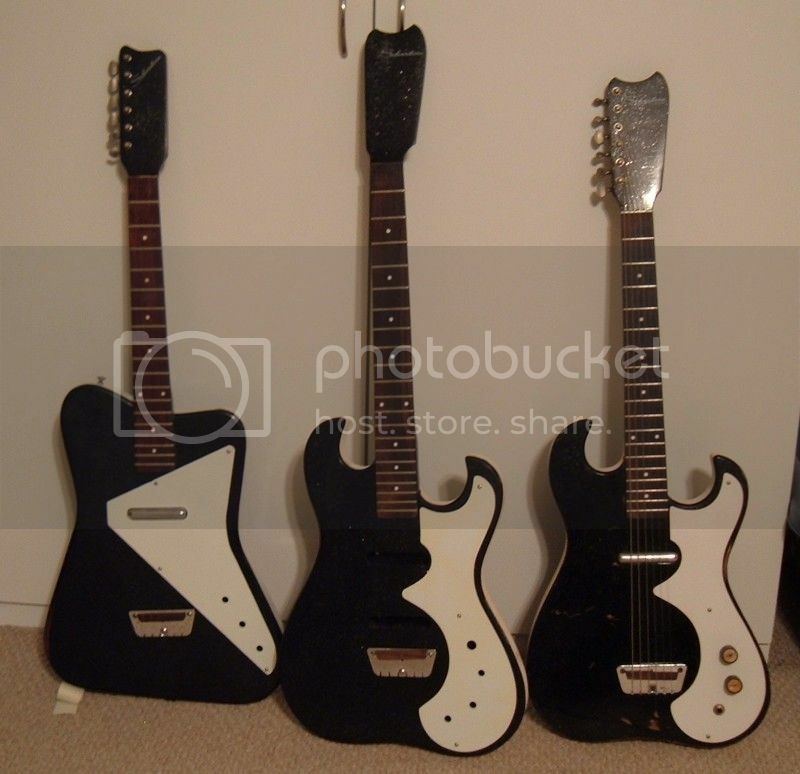 They're amazing guitars I absolutely love mine. 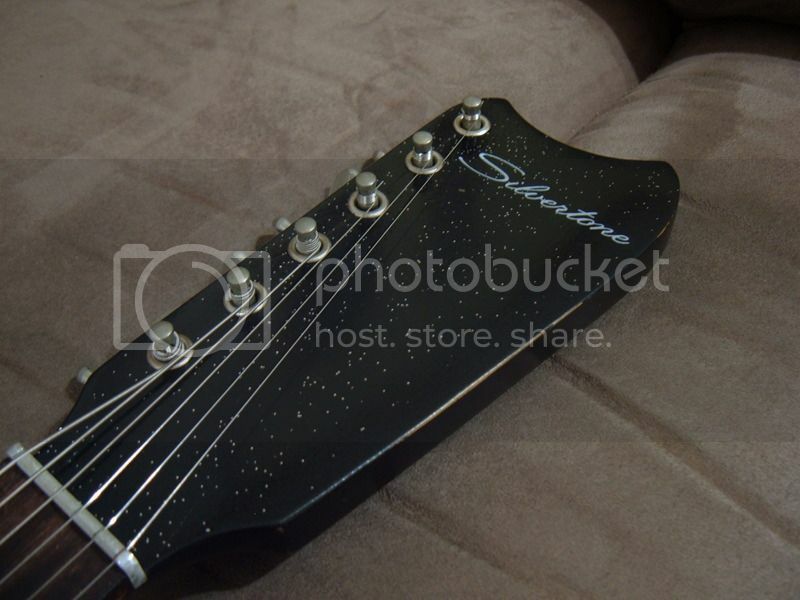 guitars that feels so comfortable in your hands from the first time you play it. It's like I've had it for years. if you ever feel like selling that, hit me up. i desperately regret getting rid of mine. Looking at these awesome builds gives me the urge to find my ~62 1448 body thats somewhere on the attic complete with a totally moldy and trashed amp-in-case. Maybe a spring project. Really like a buddys 1457, weird serial wiring if i remember correctly, though. 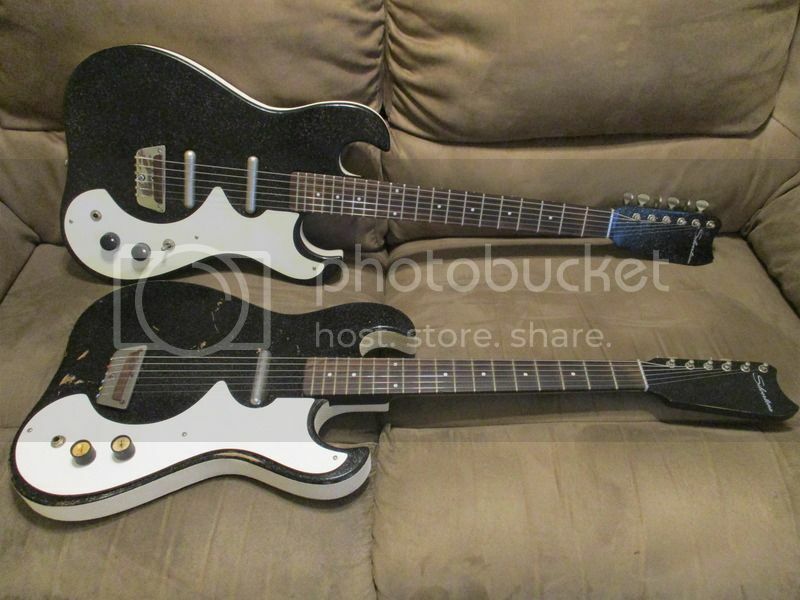 None of that on the 1448, I like single pickup guitars for their lack of alternatives to ponder over. Here's an update on the Pro 1 build. 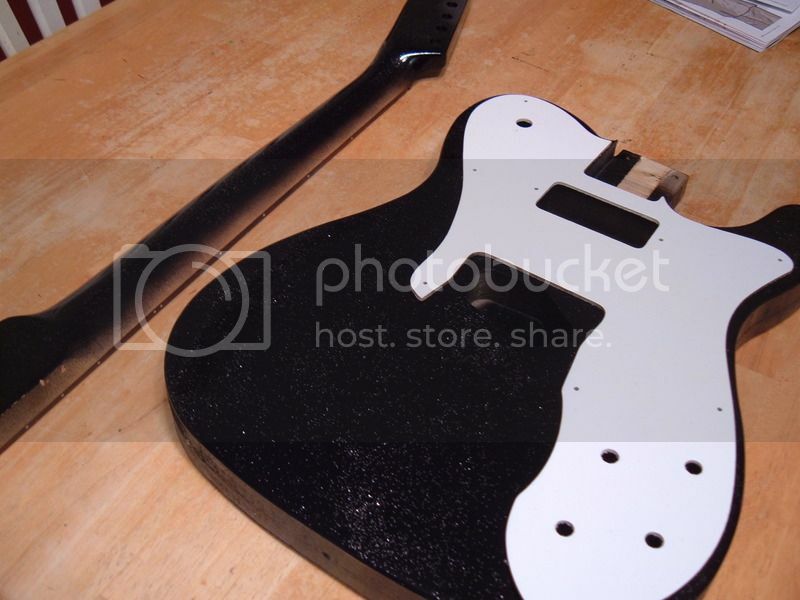 Been working on the black sparkle Silvertone style paint. I'm happy with it so far. 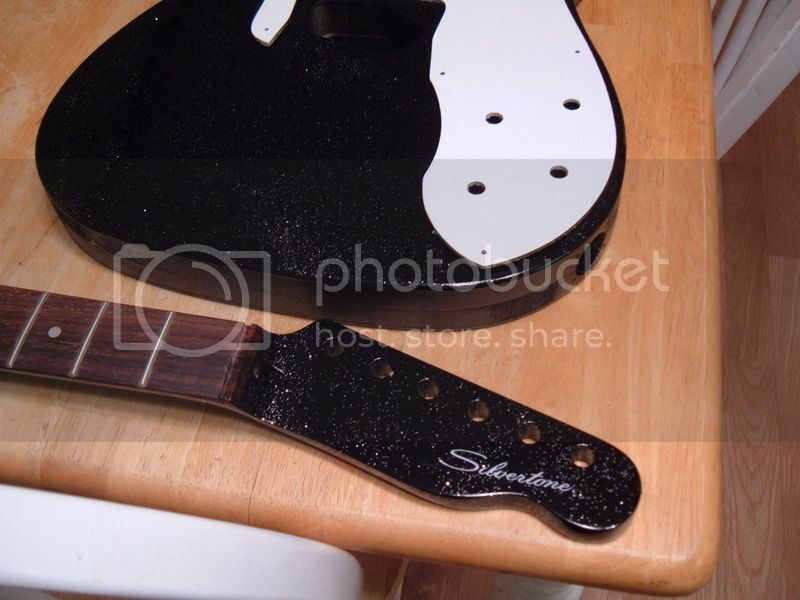 Another little update on the dano/silvertone builds. 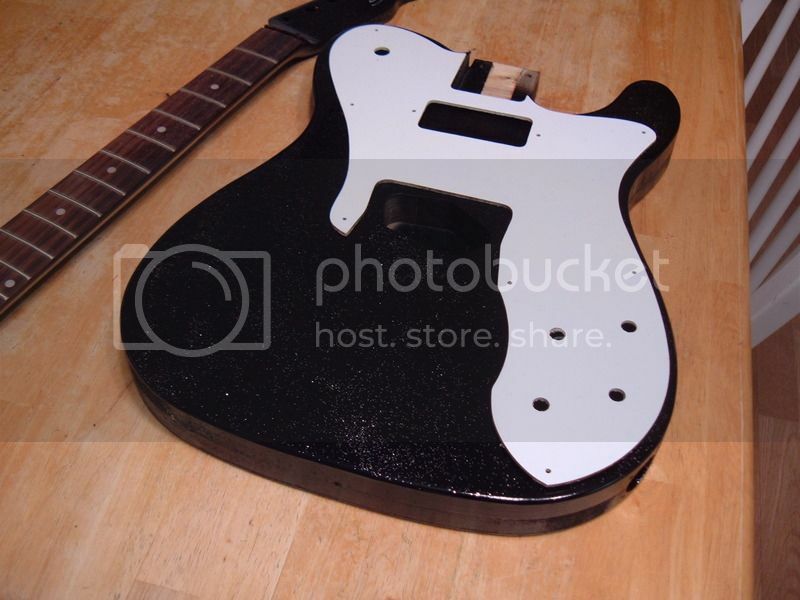 I bought this body off ebay and repaired the holes and painted it to match the neck I bought off Con Tiki over at offset. It's turning out real nice. 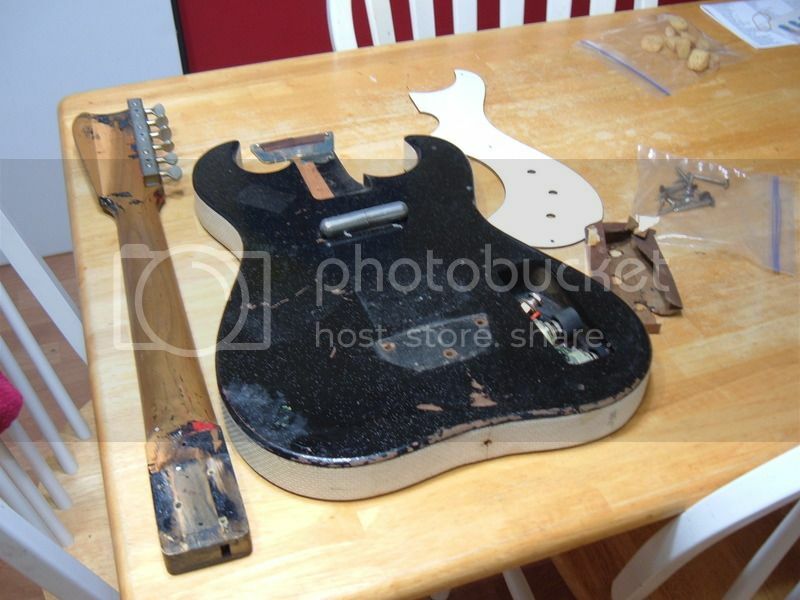 So I'll have a 1448 and a 2 pickup 1449 when completed. The pro 1 is finished except for a nut, pots and an input jack. 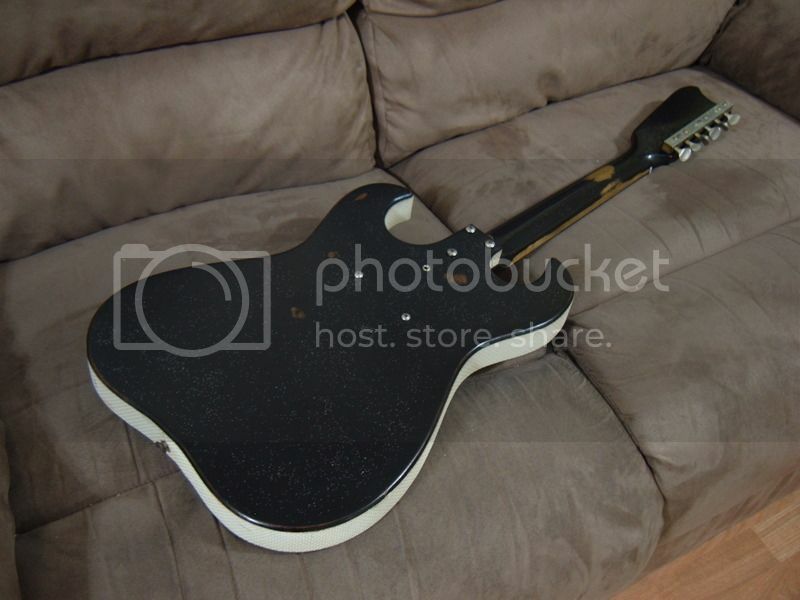 I'm probably going to trade it since it's pretty much the same as the 1448, just a different body shape. 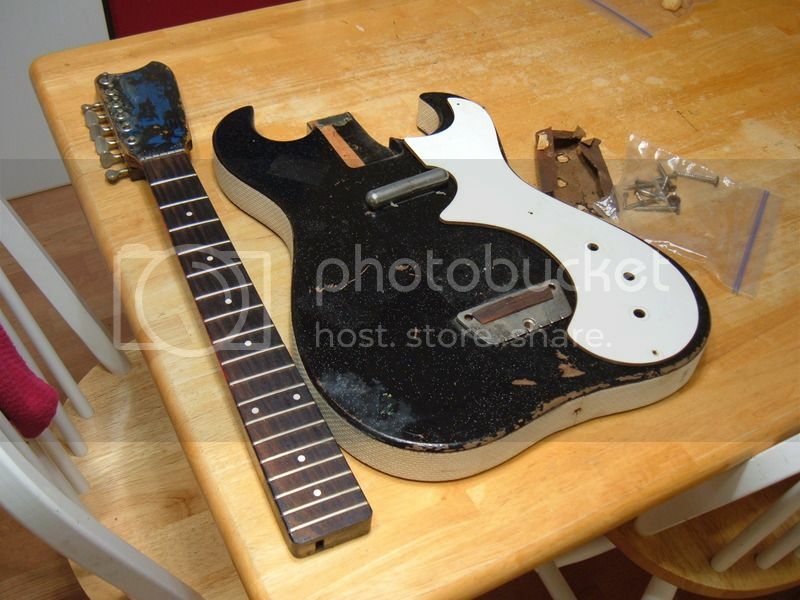 I've got a tele custom silvertone build in the works as well. I've been painting everything black w/silver specks. I still haven't got around to painting the longhorns and the U1. They won't be black w/silver specks. 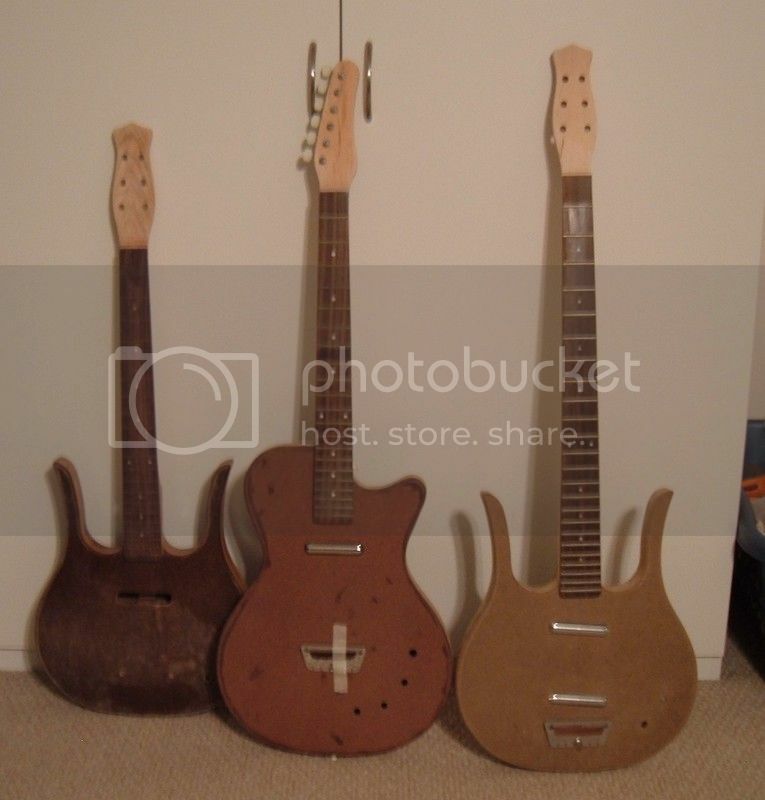 Going for copperburst and copper on those two. 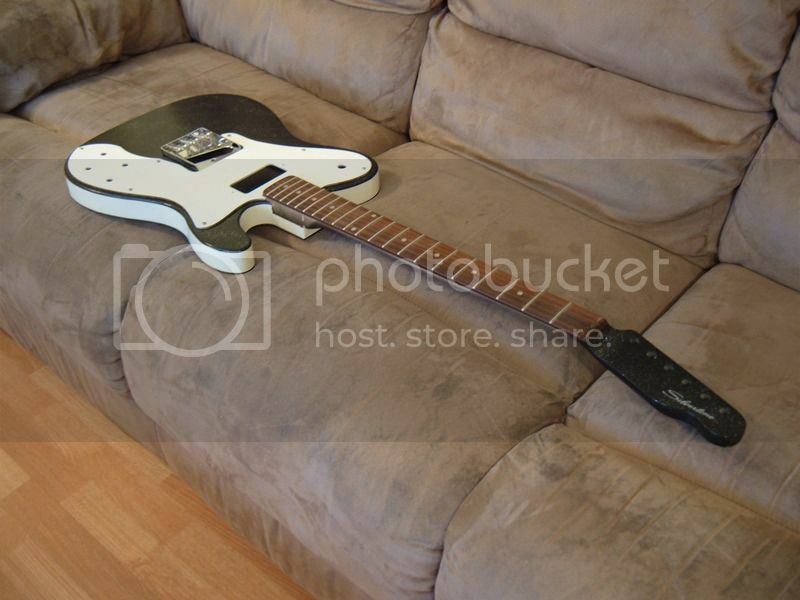 That tele looking one is super hot. Bruh. I may need to hit you up about these things if that's ever cool. Your work is insane. Thanks guys. 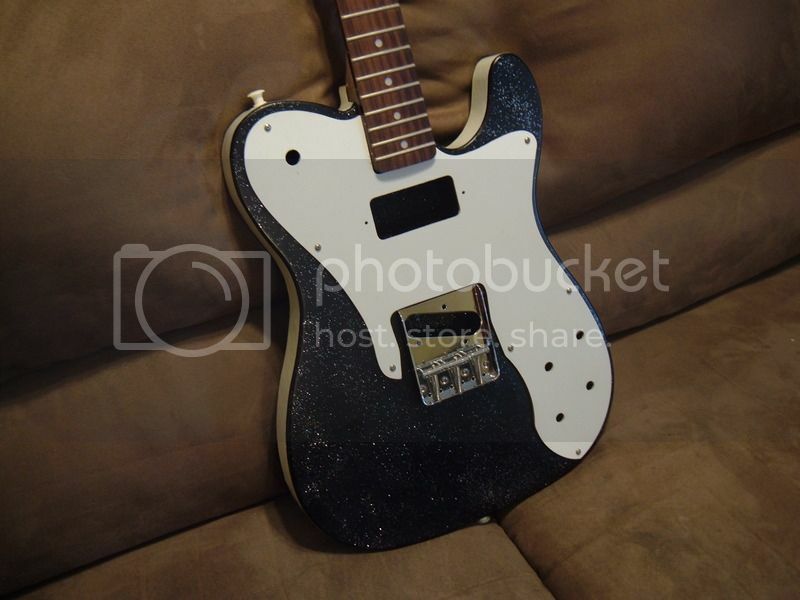 Got the tele custom together this weekend. 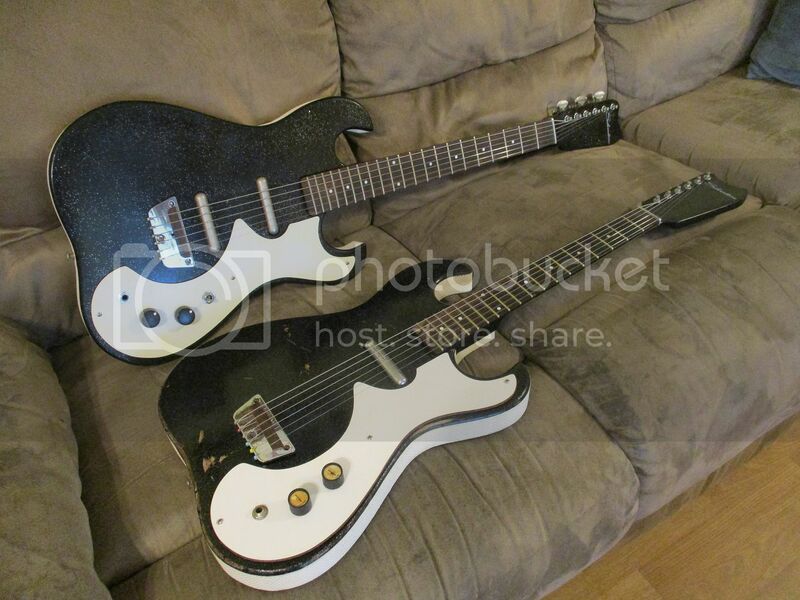 I've realised I started way too many of these Silvertone/Dano builds. 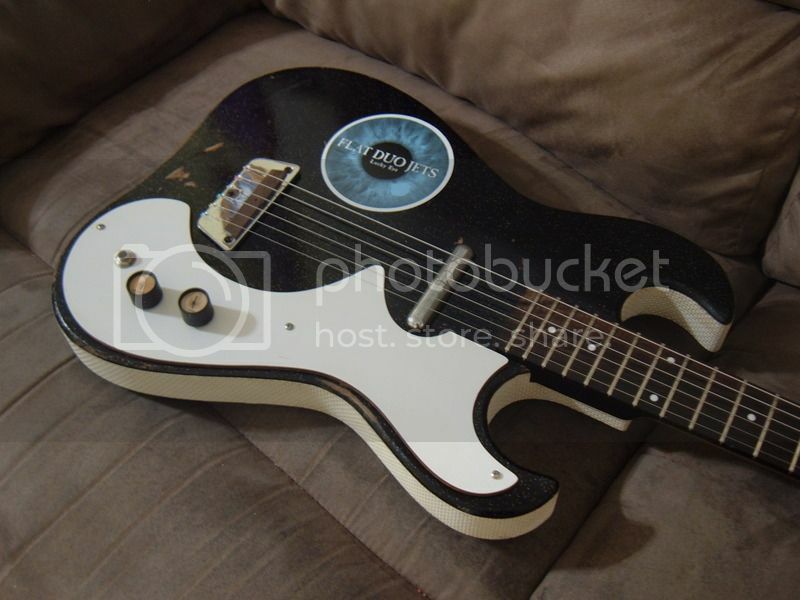 Love these Dano builds. 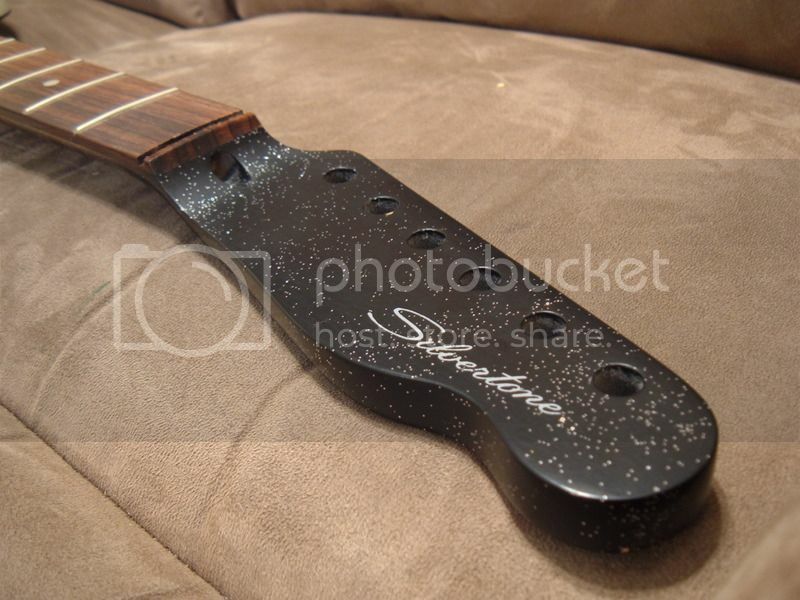 Did you notice a difference between the ply frame and the pine frame as far as sound? I can't really say yet. The pine frame projects are to only ones I've finshed so far. I do love how they sound though. 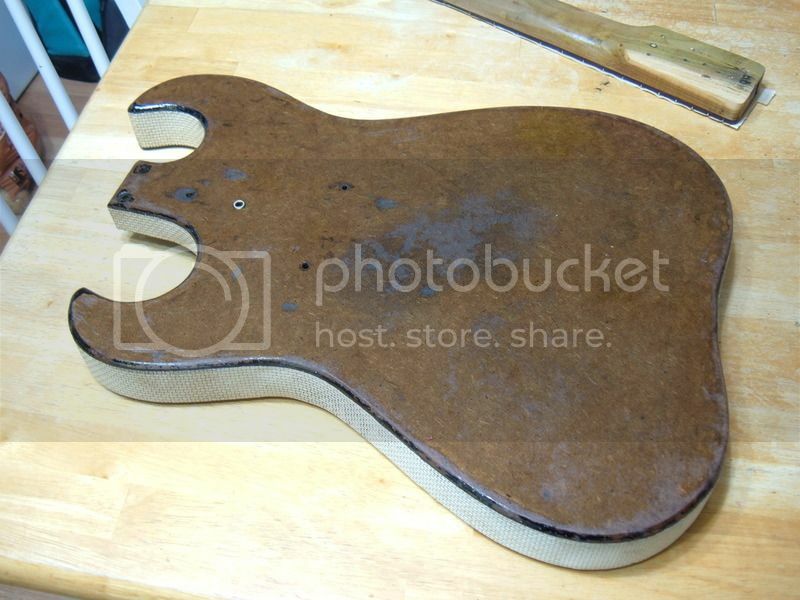 This is the first weekend in a long time that I've had time to work on guitars. I finally got the 1449 wired up and strung up. Here's a shot of the two side by side.